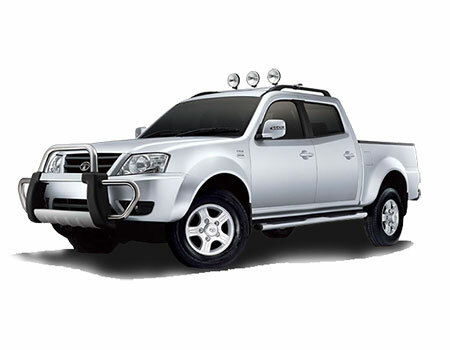 Initially launched as the redesigned Tata Tl in 2006, Tata Xenon is the pickup truck which is featured with the extended cab for selected markets. The same platform also gives the rise to Tata Sumo Grande, the passenger variant from Tata. The vehicle comprises the impressive off-road abilities of four-wheel drive and stylish on-road presence. The front fascia embodies projector headlamps over the curvy bonnet that gives a smart front impression. The well-styled pickup gets clean lines penned by concept group making it modern and mature in look. The up-swept window line at rear doors is a neat stylistic touch. The bulging wheel arches suits with the robust appearance while the body on ladder frame chassis, live axle at rear and proper set of low range gear ratios are noticeable feature of Xenon. The extended cab version with four door can carry 500 kg luggage where the whole dimensions lies at 5125 mm X 1860 mm X 1833 mm (L X W X H). What to opt for: Xenon is powerful vehicle and posses the masculine and robust appearance. It does not have the much pricey exteriors, however the body parts insurance will be right for the customers. The simple and functional designs are tailored to make driver meet high-class luxury. The dual tone silver grey interior at curvy dashboard is impressive while hard plastic material shows the robustness. The better ergonomics of the car is not only comfortable but is also easy to handle, while the bolstering seats makes journey more comfortable. The power steering makes the instantaneous response while the adjustable lumbar support seats and electric cup holder makes additional convenience. The sunshade band on the screen, sun visor, magazine pockets in the door pads, rear view mirrors are available as standard. What to opt for: The powerful vehicle has the range of features and equipments. It is beneficial to get the insurance of equipments. Invoice insurance will prove added advantage since anti-theft measures are not available. The Xenon XT is the powerful pick up and posses the masculine capabilities where the range of equipments makes it more impressive. The entry-level insurance plan will be better as there is less risk of huge loss in collision for the vehicle.